Can Mormons Trust Their Prophets? When Mormon leaders taught Adam was God, Mormons then worshiped a false god. When Mormon leaders taught that polygamy was required for gaining eternal life, Mormons then submitted to behaviors contrary to biblical teaching. When Mormon leaders taught that people must atone for some sins with their own blood, Mormons then “helped” those they believed needed to shed their blood (e.g., the Mountain Meadows Massacre). If Mormons want to say certain LDS teachings were merely the non-authoritative personal opinions of the men who taught them, these Latter-day Saints must come to grips with the fact that these so-called prophets, while claiming to speak for God (but presumably knowing otherwise), led thousands of people astray. Both options – that these teachings were mere (faulty) opinions or that these teachings were at one time official doctrines of the LDS Church – place a heavy burden on today’s Mormons to explain. The truth is, these prophets (and their teachings) were untrue. They did not speak for God or represent Him in any way. May we all, at all times, heed God’s call. This entry was posted in Authority and Doctrine and tagged Authority, Doctrine. Bookmark the permalink. 125 Responses to Can Mormons Trust Their Prophets? Now clyde, who brought up Jim Jones and David Koresh? I did! I wrote about them at length pointing out that they were false prophets and anyone following them were fools. Paul pointed out clearly that after he left Ephesus there would be those who would arise from the flock that would attempt to devour the sheep. I really don’t get your point since I, and others, point out regularly those who call themselves prophets but are not. Here’s the problem. Mormons claim that their prophets are the true blue real deal thing. Christians identify those who call themselves Christians and prophets and are not. We are looking to shine the light of truth on such people where as Mormons are looking to cover-up and alibi for their false prophets. You nor any other Mormon have the guts to stand-up and call them up. This was seen clearly in the Mark Hofmann affair. These false Mormon prophets were unable to identify a con artist neither by human reason or spiritual discernment. They proved that whether judging by human ability or spiritual anointing, these apostles and prophets were phonies and just plain very un-special. And think of it. Why were they so afraid of that Salamander letter? Because first of all they believed it was true. Think of that. Secondly, they didn’t want it out there because they knew that this would reinforce and prove all of the nutty stuff about Smith and early Mormonism was in deed representative of what Smith was up to. Your prophets believed this was a legitimate letter that revealed something that they did not want anyone to know. How could they believe this? It’s because they knew that Smith was up to his eyeballs in folk magic and was romping around the countryside at night looking for buried treasure. In addition to this, there are all sorts of documented evidence that Smith was taking money for this activity. He was hauled into court because of it. He was a known con man. Some of the stories Smith told were so fantastic and clearly so ridiculous, that even the Mormon apostles and prophets thought that a Salamander story could be true. This is what happens when people give themselves to a tale that they want to believe and get an emotional reward as a result. Just look at how you will come up with any explanation in order to continue to believe something you desire to believe. There isn’t anything that can disabuse you from your deep desire because you’ve invested your life in it. If it isn’t true, where do you go. You’re stuck. So it’s just easier to double down. I might need spell check, but you need the Real Jesus. You say I cannot spell, but at least I know the truth and do e not follow a false prophet and can defend what I believe, unlike you and Fred who give replies that make us wonder what your saying. Thank you for showing the difference between Moses’s teaching and the teaching of the NT prophets. NOW, BY APPLYING SHARON’S TEST TO THE BIBLE PROPHETS YOU WILL FIND THAT THEY ARE ALSO FALSE. So either the Bible is false or your test is bad. You need to understand that clyde is the blog busybody. He’s very concerned with how many posts we write, how we spell and anything that has nothing to do with the topic at hand. What does that tell you? He has nothing to offer. He ties fred as the shallowest Mormon posters we’ve ever had on the blog. Their purpose in being here is just to disrupt the flow. Yet, in the meantime, a member of the church, with far lesser credentials than the brethren, began to suspect Hofmann was a forger based on personal experience, facts and research rather than feelings or divine guidance. Hofmann realized he might be exposed, so he blew the guy up with a letter bomb. To throw the investigation away from himself, he tried to blow up the first guy’s business associate, but unintentionally killed the associates wife instead. He was trying to deliver a third bomb, but it blew up on him. Two innocent people died because the supposedly inspired brethren didn’t have a clue they were dealing with a criminal. (I don’t know, but I suspect Hofmann was smart enough to wear garments and a thin shirt when meeting with the brethren. If they had discerned Hofmann’s character earlier and exposed him, two families wouldn’t have suffered the loss of a parent. And the brethren would have looked exceptionally inspired instead of like unexceptional business guys with exceptional opinions of themselves. I bought insurance from a guy once. Later I found that he killed his wife. I did not see that coming. I guess I have that similarity with the prophets. If you believe the Bible prophets are false and we have more than proven your church is false, why do you stay and call your self a Mormon? Why not just be an atheist or join some or cult? The only thing you have in common with the prophets is you like them don’t know Jesus and you are teaching false doctrine. I see you never address the issue of why your prophets who speak for God and claim to hear from God and claim they can never lead the church astray, never heard from God about the issue of the fakes. So they either prayed to God and never heard from Him that hofmann was a fake, or they never prayed feeling the need to simply reply on their feelings and feeling this guy was honest. Either way it is a lose, lose position and proves the LDS prophets are fake and false. And of course as usual you have no answers. As far as I can make out Fred’s comeback to the abundance and contradictions and reversals among Mormon “prophets” is some obscure claim that Paul (according to Fred’s calculation) had a contradiction of something. But his argument is apparently so weak and unsustainable that he won’t actually make his argument. Fred’s attitude I think is indicative of something deeper that is seen in some religions and particularly among Mormons – it’s an attitude that they have greater enlightenment or hidden knowledge that us poor Christians just cannot perceive their superior knowledge and revelation. Fred thinks he is enlightened, and he knows why all the huge contradictions between LDS “prophets” don’t matter. He can’t come down to our level to make his case. It’s funny how heresy and heretics don’t change over the centuries. The Gnostics also claimed to have secret knowledge. The Church Fathers write about how the Gnostics would twist Scripture to try and justify their heretical beliefs. The answer for the Church Fathers was to point to the tradition of the Church teaching being handed down by the apostles to the Bishops. It was the only way to deal with the heretics. It’s the same with the Mormons, be it the rank and file or the false apostles and prophets. The only way Mormonism can hold the scam together is to claim “revelation”. Mormon revelation is of the sort that they have to make another run at it periodically because it’s so flawed and so they have “continuous revelation”. It means that we didn’t get it right the first twenty times so here it goes again. The Mormon prophets and apostles are so obviously not ready for prime time operators that the only thing that keeps the tale going is a manufactured burning in the bosom that’s suppose to prove that all of the wrong stuff was really right even though it was wrong. I am so happy that I never got sucked into a religious cult. I wouldn’t have lasted long any way. I have this driving curiosity which doesn’t serve anyone in these bogus outfits well because it’s a “keep your mouth shut and fall in line” sort of atmosphere. It feels so good to be free in Jesus and not have to submit to some false religious mafia type organization. Praise His Holy Name who set me apart, called me, justified me and sanctified me for eternal life in His presence; not on the basis of worthless works but on the basis of faith in the Lord Jesus Christ. Fred, you have used what you call my “test” of prophets to challenge the Christians here on Mormon Coffee. It appears that you have misunderstood my comments. 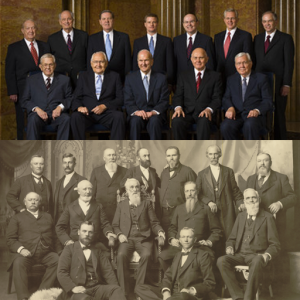 This post is about whether LDS teachings of the past were ever official, or if they were just opinions of the Church leaders who taught them. There is no “test” included in my post. I wrote: “Both options – that these teachings were mere (faulty) opinions or that these teachings were at one time official doctrines of the LDS Church – place a heavy burden on today’s Mormons to explain.” This is in the context of things such as the Mormon Church’s ban on Blacks holding the priesthood, Adam as God, etc. The question, “Can Mormons trust their prophets?” is asked in relation to the teachings that Mormons today believe are true and from God, but tomorrow may be understood as having been mere speculation or opinion. When I state, “The truth is, these prophets (and their teachings) were untrue. They did not speak for God or represent Him in any way,” this is not posited as a conclusion arrived at via the argument presented in my post. This is actually an opinion, more accurately a truth, I came to understand a long time ago by applying the biblical tests set forth in Deuteronomy. Based on what I’ve observed, there’s no way fred can process what you have written. Everything goes through the Mormon sifter and shaker and what comes out is a deer in the headlights affirmation that everything the Mormon church does and proclaims is absolutely true. In the context of the cult of Mormonism it is but in reality it’s time for the men in the white coats to do their job. In their everyday life Mormons can function quite well, but when it comes to their religion they are totally irrational. They’d believe that “Gone With the Wind” was scripture if their leaders told them so. No misunderstanding, it is plain to see that you are unwilling to look into your own faith with the same critical eye you use on Mormons. All I am asking you to do is use the same standard you use on us to look at the things you believe in. Stop using your double standard. When you see that YOUR STANDARD says that the Bible is false, you might want to inspect the “test” you are using. Then you need to ask if the Prophets of old were false, or are you using a bad standard. I know it is easier to call me and other Mormons bad names then it is to open your mind to learn something you do not want to know, but you might want to try. so it is’nt safe spiritually to follow them as authorities . 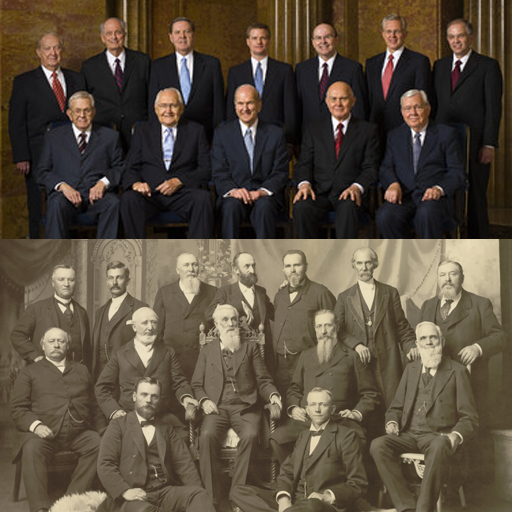 Mormon prophets and apostles claim to offer the answer to the above problems . claim to have heard from God but actually are only speaking their own message . the Lord Jesus Christ. It is also not silent on how to detect false prophets/apostles. strength to do this soon . This is really messing my mind up. I see you think a prophet should know when he is being deceived. Thoughts of the passover plot run through my head. Jesus probably was a fraud. After all he did tell Judas to go do it. The idea of the guard being paid off not to break his legs seems to fall into place and being professional enough to just pierce the heart sack and not the heart seems logical. People can say this and sound so logical that one can believe them. You are the people who believe that we all should still be in the garden of eden. Not knowing what is Good or Evil or the difference between happy and sad or laughing and crying. Wow this life is pretty neat. I am glad I am learning what is good and what is evil. Is it what I do or what I believe in that is pleasing to God? It seems to be part of the puzzle too. You have discerned that I am wrong but my religion makes sense to me. By the way it is not how many times you post that bothers me it is just that you get little or no feed back from a passing mormon when only two people are talking about the subject and have posted more than half the time. Who was called a terrorist by a Mormon on this blog most recently? I believe that would be me. I didn’t call you a name. I made an observation regarding what I see as your inability to take in information, process it and formulate a cogent, meaningful response. All we get from you is one or two nebulous sentences that demonstrate that you basically skim across the surface and repeat the same tired Mormon slogans. That shows a closed mind, unwilling to seriously examine Mormonism. You demonstrate most, if not all, of the characteristic thinking of someone caught in a cult. BTW, I’ve taken Mormonism apart and examined it for any sign of truth and have concluded that no truth exists within the LDS church, Joseph Smith, the BoM, the current or former prophets and most certainly not what is taught about Jesus, God the Father, the Holy Spirit and God’s plan of salvation for mankind. I’ve also received personal revelation regarding these things confirming that Mormonism is indeed false. fred I see no depth of thought and certainly no reasonable attempt on your point to honestly and sincerely examine Mormonism. You’ve given yourself over to a false religious system that has rendered you powerless in finding the truth. Talk about messed-up thinking. Do you know anything at all about what was going on the last days of Jesus’ life? This is so typical of Mormon thinking and most certainly the odd heretical cults that lift a verse of Scripture and draw all sorts of erroneous conclusions from it. How far are you willing to go to prop-up the false prophets that have and do lead the Mormon church? It seems to me there’s been an erosion in your view of Mormon prophets since this thread began. Your standards are so low now that a non-Mormon standing on the grounds of a Mormon temple repeating gibberish could be considered a Mormon prophet. This is what happens when people don’t know the Bible and will accept fantastic stories as a substitute for actually sincere, devoted study of God’s Word and the history and traditions of His Church, the Mystical Body of Christ. Lack of knowledge,lack of sincere thought, lack of an inquisitive mind and finally lack of even a modicum of spiritual discernment are the characteristics of people caught in false religious systems guided by false prophets. You fit the bill clyde. This is serious business. You need to take off your Mormon magic glasses and begin to see God as He is and not how the false prophets of Mormonism have portrayed Him. There is no such thing as an honest appraisal of Mormonism that the religion is false; by those who have bought the fantasy hook, line and sinker. There can’t be an objective review of the religion by a true believer who is so emotionally wedded to the Joseph Smith narrative. Their entire life is centered on the folk lore. I get a kick out of Mormons challenging us to study the religion to find the truth. That’s really odd since those of us who post here have done just that and found the religion to be a totally fabricated fraud. For true believers, the only study that is honest is the one that concludes that Mormonism is true. Any other study is illegitimate, flawed and not serious. Mormonism is true, is the only acceptable outcome of study according to the true believers. It’s ironic because the pathway to finding Mormon truth and enlightenment we are told, comes from a physical, emotional reaction in response to a sincere prayer and a reading of the BoM. The reason for this is that absent the pseudo-spiritual buzz, the answer will always be, “Mormonism is false”. It’s easier to develop excuses and fantastic explanations to the evidence that Mormonism is false than to have to face the truth. That’s a bummer to have to give-up an idea that you’re emotionally attached to. I think what happens often is that those exiting Mormonism get this burning in the bosom that something is not right with the religion. It’s at that point that they are open to the possibility that what they have been accepting as true, may just be false. The more disenchanted they become with the religious system and the lame explanations that support it, the more they are willing to consider alternatives. If Mormon prophets don’t know when they’re deceived, how do you know they’re leading you into truth? How do you know the LDS prophets are not deceived most if not all of the time? It is at least a possibility given their track record. I am convinced they don’t teach the truth of who God is, and what He has done to save us sinners. God has done everything. It’s not about what you do, it’s about a loving God who gave His life for you to save you apart from anything you ever said or did. Jesus completely followed the law and lived a sinless life, not as an example for us, but so that He could be our passover lamb – taking all our sin upon Himself on the cross. 1900 yrs ago so even today we need to evaluate their teachings. So test your apostles. Have you read the Passover Plot? The Book is very interesting and can be very faith shaking. It is also very logical. I once asked a question a long time ago. It was a simply question meant to lead to some understanding of what I believe. However it was not answered but ignore by the response of you don’t answer our question we won’t answer yours. You do not seek understanding but seem to want to build walls of separation. Aside from that, there was no “test” here, as Sharon explains. Instead of answering the post, our Mormon friend makes vague statements, and then cries “gotcha” when he thinks that we Christians are caught in some kind of contradiction. Instead of focusing on these issues, we get vague statements and well poisoning. There will be no answers from the Mormons on this one. They have none. Schonfield’s book is so full of holes that when I read it in 1979 (as a Mormon) it did nothing to “shake my faith”. It’s same series of mistakes, conjectures and speculations are still there. (The unidentified man who plotted with Jesus to drug him on the cross and impersonated him later is the whopper that had any serious scholar wondering how an author could be so desperate).